A fantastic accompaniment for a curry feast! On the Emerald Isle (Ireland) they talk about the potato with a kind of Guinness-like reverence. Historically, they boil it and mash with milk, butter and spring onions, call it champ and stick next to everything on a plate. If I were a potato, I’d be sticking my hand up to be made into champ; it’s fantastic. 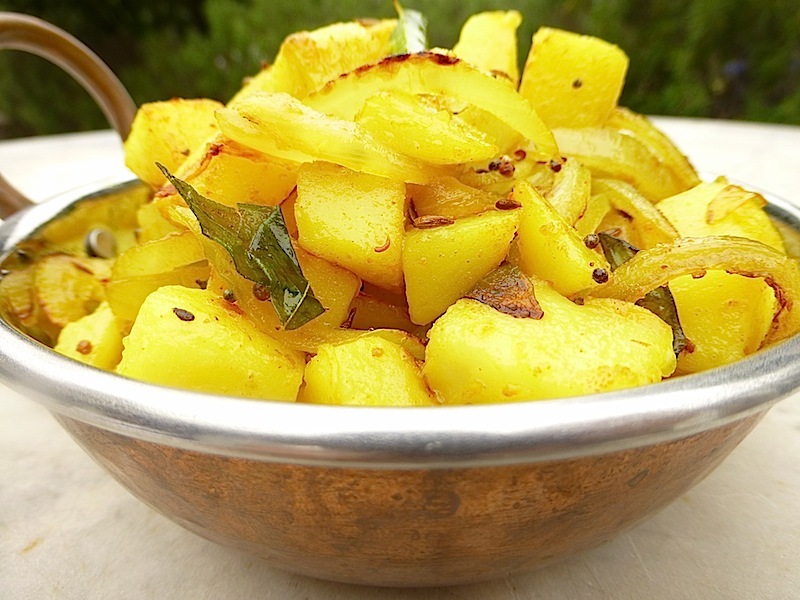 This curry, well let’s call it a dry-fry, does equally magical things with the potato. Huge claim, I know, but try it and send me your thoughts. The great trick here is in the pre-cooking of the potatoes. Quite simply we are retaining the barely cooked-texture of each piece of potato in the centre, but allowing the surface area to be sufficiently tender so that it will absorb the beautifully spiced oil. ½ an onion sliced into half moons. Into heavily salted boiling water, carefully slide in the potatoes and simmer for 7 mins. Strain through a colander and leave potatoes in their own heat for 10 minutes or so to finish cooking. Meanwhile in a dry fry pan, heat cumin seeds, mustard seeds and dill seeds. Heat over a medium flame, swirling the pan and watching to see the seeds are getting hot and jumpy. Once a little smoke is beginning to form, you’re there. Add vegetable oil or ghee, onion and curry leaves and sauté 3-4 mins stirring until edges of onion are just beginning to brown. Add potatoes, turmeric and plenty of salt to taste. Tossing and shaking as you cook to coat potatoes in everything, sauté for around 5 minutes over medium heat. Use the onions as a guide for how long to cook; they shouldn’t darken too much, a deep golden colour is what we’re after.